Background: Induction with cyclophosphamide (CYC) and glucocorticoids in antineutrophil cytoplasmic antibody-associated vasculitis (AAV) has a relapse of 30%–50%. Studies show that rituximab (RTX) is superior to CYC in refractory/relapsed AAV. We prospectively analyzed efficacy and safety of RTX in CYC-failed cases of AAV. Methods: Patients with AAV who relapsed or were refractory to CYC therapy were given RTX 1 gm at 0 and 15 days, followed by maintenance with 500 mg every 4–6 months. All patients received oral prednisolone. Disease activity was defined by Birmingham Vasculitis Activity Score/Wegener's granulomatosis (BVAS/WG). Remission was defined by the European League Against Rheumatism criteria. Results: From August 2012 to July 2018, 67 patients with AAV were seen at our center; 21 patients who relapsed after inductions with CYC or were refractory to CYC received RTX; 8 (38%) were refractory and 13 (62%) were relapsed AAV; 20 were anti-proteinase 3 positive and 1 was anti-myeloperoxidase positive. All were granulomatosis with polyangiitis (GPA). Mean time to relapse was 12.04 ± 7.8 months. Most common indication for RTX was lung followed by ophthalmic, renal, ear nose throat, and nervous system involvement. Median follow-up after induction with RTX was 24 months. Mean BVAS/WG was 11.2 at baseline, 0.66 at the end of 3 months, 0.16 at the end of 6 months, and remained stable at that value at 18 months. At 24 months, 16 patients (76.19%) remained in remission. One was refractory to RTX treatment even after 2 years. Two patients died and two were still under follow-up. Conclusion: In our experience, RTX is a good induction and maintenance strategy for relapsed/refractory AAV. Induction with oral or intravenous (IV) cyclophosphamide (CYC) and glucocorticoids is the mainstay of treatment of antineutrophil cytoplasmic antibody (ANCA)-associated vasculitis (AAV).,, In the original series of 158 patients with granulomatosis with polyangiitis (GPA) followed up at the National Institutes of Health with a therapeutic strategy of daily oral low-dose CYC and glucocorticoids, 50% of remissions were associated with one or more relapse. Another series from Chapel Hill, North Carolina, of 107 patients with microscopic polyangiitis and ANCA-associated crescentic glomerulonephritis treated with oral CYC and glucocorticoids, 75 patients went to remission. Twenty-two of these responders (29%) suffered a relapse with 18 months of the end of therapy. In the last decade, rituximab (RTX) has emerged as an effective alternative for newly diagnosed or relapsed or refractory cases of AAV. Landmark study, namely, the RTX for ANCA-associated vasculitis (RAVE) trial has shown that RTX is noninferior to oral CYC in remission induction for severe AAV and may be superior in relapsing disease. RTX treatment has led to 80%–90% remission rates among patients with severe relapsing or refractory AAV and may be safer that CYC regimens., We prospectively analyzed effectiveness of RTX in relapsed/refractory disease in our cohort of patients with AAV. This was a prospective observational study carried out in the division of rheumatology and clinical immunology of a tertiary care center in Gurgaon from August 2012 to July 2018. During the study period, 67 patients of AAV were admitted or received outpatient treatment from our center. The diagnosis of AAV was made on the basis of the clinical features, by biopsy of a relevant involved organ and the presence of ANCA. Further, AAV was defined as per the American College of Rheumatology (ACR) clinical criteria and the 2012 Chapel Hill Consensus Conference (CHCC) nomenclature for vasculitis., At initial evaluation, all 67 patients were tested for ANCA both by indirect immunofluorescence and for anti-proteinase 3 (PR3)-ANCA and myeloperoxidase (MPO)-ANCA by line immunoassay. Disease activity was assessed by the Birmingham Vasculitis Activity Score/Wegener's granulomatosis (BVAS/WG) and by physician's clinical assessment and expertise., Treatment of AAV was given according to standard regimen consisting of oral prednisolone starting with 1 mg/kg for 1 month followed by gradual tapering until a dose of 5–7.5 mg/day by 6 months was achieved. IV methylprednisolone pulse as a part of induction treatment was given for severe and life-threatening indications such as rapidly progressing glomerulonephritis and diffuse alveolar hemorrhage. IV CYC pulse at the dose of 15 mg/kg body weight was given monthly for 6 months. Once remission was achieved, maintenance of remission consisted of oral azathioprine 2–3 mg/kg and low-dose prednisolone. Response to treatment was defined according to the European League Against Rheumatism (EULAR) recommendations, namely remission was defined as the absence of disease activity, i.e., BVAS = 0; relapse was defined as the recurrence or new onset of disease activity attributable to active vasculitis, i.e., BVAS ≥1; and refractory disease was defined as lack of response or <50% reduction in disease activity after 4–6 weeks of treatment. Relapse in renal disease was defined as not only rapidly progressing renal failure but also new-onset red blood cell (RBC) casts. Refractory disease was defined as persistently raised creatinine and/or RBC casts even on initial induction therapy with CYC. Those patients who did not achieve remission on 6 months of IV CYC or had relapsed after inductions with CYC were given RTX infusions at a dose of 1 g at days 0 and 15. Maintenance RTX dose was 500 mg after 4–6 months depending on the disease activity status. Maintenance dose was continued every 6 months for minimum of 2 years along with low-dose prednisolone at a dose of 2.5 mg daily. Before commencing RTX infusion, patients were screened for HIV, hepatitis C virus, and hepatitis B virus infection. Tuberculosis was also ruled out by negative sputum smear and negative Mantoux and other relevant clinical tests. The demographic and clinical features, laboratory data, disease activity, and therapeutic outcome of these relapsed/refractory AAV patients were analyzed prospectively from the first time they were given RTX induction till last maintenance dose. This study was approved by the ethics committee of our institution. All patients gave written informed consent prior to their enrollment in this study. Twenty-one of 67 patients either relapsed or had refractory AAV with standard treatment regimen. The mean age of these 21 patients was 47.7 ± 14.5 years. All were GPA as per the 2012 CHCC nomenclature and ACR clinical criteria. Twenty patients were anti-PR3 positive and only one was anti-MPO positive. Of 21 patients, 13 had relapsed after completing 6 cycles of CYC, while 8 were refractory to standard therapy [Table 1]. Most of the relapses had occurred within the first 2 years of CYC therapy. Mean time to relapse was 12.04 ± 7.8 months. Of these 8 refractory AAV patients, one was on oral CYC (given at another center) with a cumulative dose 109.5 g. Two patients received extended CYC cycles >6 months for refractory disease. Five were given RTX before completion of 6 cycles of CYC. Overall, these 21 patients had received a median cumulative CYC of 6 g (range: 2–109.5 g). The organ involvement and hence indication for RTX [Table 1] was predominantly lung involvement which was in 10 patients (52%) which also included 3 patients with subglottic stenosis. RTX was given for ophthalmic indications in 5 patients (23.8%) for refractory scleritis as well as new-onset pseudotumor orbit in these. Three patients (14.28%) had renal involvement; two had persistently raised creatinine, while one had new-onset glomerulonephritis despite initial induction. Ear nose throat (ENT) and nervous system indications were in 1 patient (4.76%) each. These included persistent mastoiditis and new-onset pachymeningitis, respectively. At baseline, i.e., the start of induction with RTX, the mean BVAS was 11.2 ± 4.28 and mean daily prednisolone dose was 50 ± 11.5 mg. By 6 months, the median daily prednisolone dose was 5 mg with a range of 2.5–7.5 mg. The median follow-up was 24 months (range: 2–60 months) since RTX was started. 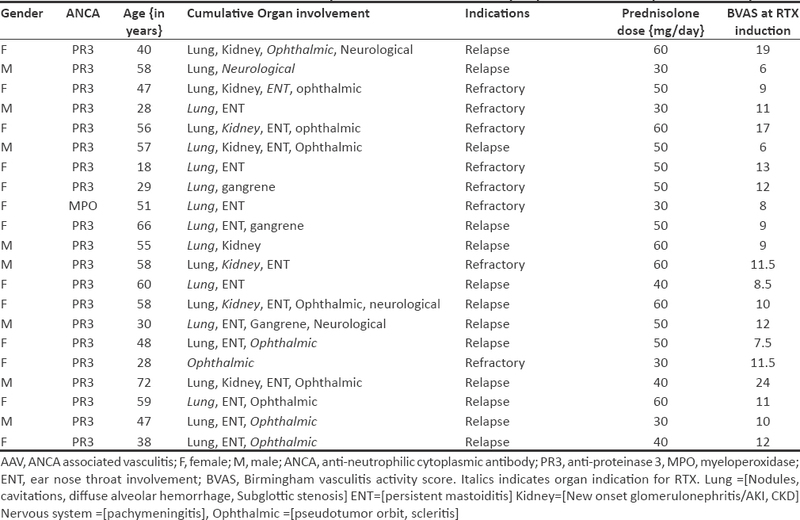 The outcome to RTX of the 19 patients who completed 24 months of follow up is shown in [Table 2]. The mean BVAS/WG that at baseline was 11.2 decreased to 0.66 at the end of 3 months, further decreased to 0.16 at the end of 6 months, and remained stable at that value at 12 and 18 months. Fifteen patients of 21 achieved remission at the end of 3 months, and another 2 achieved remission by 6 months. At the end of 24 months, 16 patients achieved and remained in remission. One patient was refractory to RTX treatment which was noted from 3 months onwards and remained refractory even after 2 years of induction and maintenance RTX. There were two deaths during study period. Both of them had severe subglottic stenosis and died due to pulmonary infections. One patient died after 2 months of RTX while other died after 1 year of induction and maintenance RTX. Two of the 21 patients were yet to to complete the follow-up. There were no unusual or severe infections or other adverse events noted during the study period. Ours was a observational study where 21 patients with AAV who relapsed or were refractory to standard CYC and oral prednisolone regimen received RTX induction and maintenance. Pulmonary relapse/refractory was the most common indication for RTX in our study. This was consistent with other studies which have shown pulmonary involvement is the most common manifestation in GPA-relapsed cases, as was shown in a follow-up of the RAVE trial. We found that RTX was able to induce remission even in difficult to treat subglottic stenosis. Our findings are consistent with the existing literature. A retrospective observational study showed that patients who have received RTX had no active ENT disease during 92.4% of the observational period (days), compared with 53.7% of the observational period for patients who did not receive RTX. The case series from the French Vasculitis Study Group on the use of RTX in subglottic stenosis showed that three-fourth patients have responded to RTX. In the RAVE trial, renal involvement was present in 52% patients (at enrollment) in RTX arm and 52% in the control arm. The baseline renal functions were worse in the RTX group, but the number of patients who reached the primary end point at 6 months was similar. Similarly, in the RITUXVAS trial where patients with renal AAV were randomized to IV CYC versus RTX, 76% patients in the RTX group versus 82% patients in IV CYC achieved sustained remission at 12 months., We also found that RTX was beneficial in those patients with renal involvement. Out of the three patients who received RTX for renal involvement, two patients had persistently raised creatinine despite 6 months of pulse CYC therapy while one had new-onset glomerulonephritis. With RTX induction, two of these patients achieved remission at 6 months; unfortunately, one patient progressed to chronic kidney disease at 24 months and is registered for renal transplantation. A retrospective analysis has shown that RTX is useful in inducing remission in refractory eye conditions such as orbital granulomas and has been confirmed in few case reports as well., Further efficacy of RTX in refractory ENT and tougher conditions such as pachymeningitis has been demonstrated in few studies., From our study, we also experienced that RTX was beneficial for relapsing/refractory ENT conditions such as persistent mastoiditis and ophthalmic indications such as refractory scleritis and pseudotumor orbit and for even rarer conditions such as pachymeningitis. We also used RTX for maintenance at dosage of 500 mg every 6 months. By 24 months, 16 of 21 patients (76%) remained in remission. Prednisolone (or equivalent) was tapered down to 5 mg daily at 6 months. Our analysis was consistent with MAINRITSAN-1 and MAINRITSAN-2 trials which clearly demonstrated that RTX was good at maintaining remission in AAV, especially in GPA., Data with only induction/maintenance RTX without steroids are sparse; however, the LoVAS trial which is first to examine the potential of RTX to reduce corticosteroid dose in remission induction of AAV is currently underway. We did not encounter any serious adverse events in any of the patients during median follow-up of 24 months. Patient compliance was better since there was reduction in daily number of medicines (no immunosuppressant used apart from low dose of steroids). Hence, we could establish maintenance efficacy in real-life setting. The strength of this study is its prospective long term follow-up of the patients who had RTX for relapsed/refractory AAV. The limitations of our study were a small sample size. Second, measurement of disease activity was purely clinical based on BVAS and physician's expertise, ANCA was not tested in these patients again at remission, and hence, correlation with serology could not be established in relapsed disease. Third, we did not measure B-cell activity during the course of RTX therapy. However, a recent study has shown that complete B-cell depletion occurs in all RTX-treated patients and usually lasts for 3–24 months. RTX appears to be a good therapeutic strategy in achieving and maintaining remission in refractory/relapsed cases of AAV. Furthermore, side effects related to steroids could be minimized since it also acts as steroid-sparing agent for the long-term maintenance of remission. We thank Dr. Molly Thabah, Additional Professor, Department of Medicine, JIPMER, Puducherry, India, for guiding me to write this article. Nachman PH, Hogan SL, Jennette JC, Falk RJ. Treatment response and relapse in antineutrophil cytoplasmic autoantibody-associated microscopic polyangiitis and glomerulonephritis. J Am Soc Nephrol 1996;7:33-9. Guillevin L, Cordier JF, Lhote F, Cohen P, Jarrousse B, Royer I, et al. Aprospective, multicenter, randomized trial comparing steroids and pulse cyclophosphamide versus steroids and oral cyclophosphamide in the treatment of generalized Wegener's granulomatosis. Arthritis Rheum 1997;40:2187-98. Jones RB, Ferraro AJ, Chaudhry AN, Brogan P, Salama AD, Smith KG, et al. Amulticenter survey of rituximab therapy for refractory antineutrophil cytoplasmic antibody-associated vasculitis. Arthritis Rheum 2009;60:2156-68. Miloslavsky EM, Specks U, Merkel PA, Seo P, Spiera R, Langford CA, et al. Rituximab for the treatment of relapses in antineutrophil cytoplasmic antibody-associated vasculitis. Arthritis Rheumatol 2014;66:3151-9. Hunder GG, Arend WP, Bloch DA, Calabrese LH, Fauci AS, Fries JF, et al. The American college of rheumatology 1990 criteria for the classification of vasculitis. Introduction. Arthritis Rheum 1990;33:1065-7. Luqmani RA, Bacon PA, Moots RJ, Janssen BA, Pall A, Emery P, et al. Birmingham vasculitis activity score (BVAS) in systemic necrotizing vasculitis. QJM 1994;87:671-8. Birmingham Vasculitis Activity Score. Available from: https://www.birmingham.ac.uk/Documents/college-mds/trials/bctu/pexivas/19-BVASV12-270214.pdf. [Last accessed on 2018 Sep 20]. Hellmich B, Flossmann O, Gross WL, Bacon P, Cohen-Tervaert JW, Guillevin L, et al. EULAR recommendations for conducting clinical studies and/or clinical trials in systemic vasculitis: Focus on anti-neutrophil cytoplasm antibody-associated vasculitis. Ann Rheum Dis 2007;66:605-17. Girard C, Charles P, Terrier B, Bussonne G, Cohen P, Pagnoux C, et al. Tracheobronchial stenoses in granulomatosis with polyangiitis (Wegener's): A report on 26 cases. Medicine (Baltimore) 2015;94:e1088. Jones RB, Furuta S, Tervaert JW, Hauser T, Luqmani R, Morgan MD, et al. Rituximab versus cyclophosphamide in ANCA-associated renal vasculitis: 2-year results of a randomised trial. Ann Rheum Dis 2015;74:1178-82. Tamura N, Matsudaira R, Hirashima M, Ikeda M, Tajima M, Nawata M, et al. Two cases of refractory Wegener's granulomatosis successfully treated with rituximab. Intern Med 2007;46:409-14. Furuta S, Sugiyama T, Umibe T, Kaneko Y, Amano K, Kurasawa K, et al. Low-dose glucocorticoids plus rituximab versus high-dose glucocorticoids plus rituximab for remission induction in ANCA-associated vasculitis (LoVAS): Protocol for a multicentre, open-label, randomised controlled trial. BMJ Open 2017;7:e018748. Chocova Z, Hruskova Z, Mareckova H, Svobodova B, Duskova D, Bednarova V, et al. Rituximab use in patients with ANCA-associated vasculitis: Clinical efficacy and impact on immunological parameters. Clin Rheumatol 2015;34:107-15.